It started a month ago. Unnoticed then. Colin Kaepernick, a backup quarterback for the NFL’s San Francisco 49ers, sat during the playing of the national anthem before his team’s first preseason game on Aug. 14. He did so again six days later. Neither instance captured attention; Kaepernick did not play in his team’s first two preseason games, according to the website sbnation.com. It was noticed on Aug. 26. A photo tweeted by Jennifer Lee Chan of Niner Nation contained the proof. Zoomed in it shows Kaepernick seated between two Gatorade coolers while everyone else stood. Within a day the player’s protest became national news. He told NFL Media, “I am not going to stand up to show pride in a flag for a country that oppresses black people and people of color,” Kaepernick said. Two days later he expounded. “I’m going to continue to stand with the people that are being oppressed,” he said. “To me, this is something that has to change. When there’s significant change and I feel that flag represents what it’s supposed to represent, and this country is representing people the way that it’s supposed to, I’ll stand. “This stand wasn’t for me. This is because I’m seeing things happen to people that don’t have a voice, people that don’t have a platform to talk and have their voices heard, and effect change. So I’m in the position where I can do that and I’m going to do that for people that can’t. “It’s something that can unify this team. It’s something that can unify this country. If we have these real conversations that are uncomfortable for a lot of people. If we have these conversations, there’s a better understanding of where both sides are coming from. By the time he said that, the backlash over his protest was already at a fever pitch. Denunciations were common and vitriolic. Among them was even a 10-minute video of people burning Kaepernick jerseys. Then something interesting happened. The backlash had a backlash of its own. Thirty-five veterans published a letter of support on Sept. 2. Five days later Forbes reported that Kaepernick’s was the top-selling NFL jersey, a position it still holds. At the same time, others started protesting. In addition to members of numerous other NFL players, college football players, high school football players and U.S. women’s soccer star Megan Rapinoe have engaged in protests of their own. Which brings us to last Friday night. Doherty High running back Michael Oppong took a knee during the anthem before his team’s game against Leominster High at Foley Stadium. My coaches and principals have decided to suspend me for 1 game. The reaction was swift and far more positive than negative. Talk of a suspension, though, was seemingly the result of a miscommunication. “Recently, athletes have displayed silent protest in support of the dialogue on race and equality that continues to evolve in every community across the nation. This weekend, a football player from Doherty Memorial High School knelt down during the National Anthem, joining the many athletes who have silently displayed their opinion. 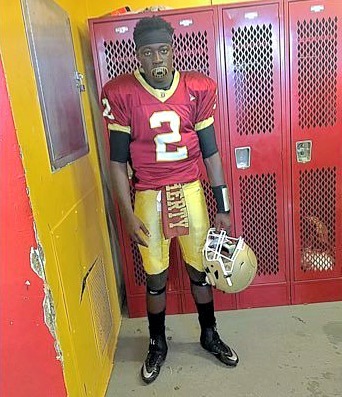 “The Doherty student did not violate any school rule when he peacefully and silently protested during the National Anthem. He exercised his Constitutional Rights without disturbing the school assembly and he is not being disciplined in any way [for] his actions. It would be nice to report that the matter was concluded. Alas, it is not. Oppong has received threatening messages, the Telegram & Gazette reported, and Worcester Public Schools have created a safety plan for him. We lament the speed with which social media enables anonymous fury. At the same time we cannot help but notice and praise how quickly those voices can be properly marginalized by those showing support not only for Oppong but for the protest he undertook. Moreover, we credit Binienda and Worcester Public Schools for quickly investigating the matter and reaching the proper conclusion in not attempting to suspend Oppong. Her decisive action is not only an object lesson in leadership, it is a valuable lesson to all students about First Amendment rights. Sun Spots with Hitch [Vol. 93]: What's the big idea, Dr. Castiel?